The Center for Science in the Public Interest (CSPI) reviewed 28 hours of Nickelodeon programming last October (2012) and noted that of the food ads shown, 69% were for items of poor nutritional value (sugary cereals, candy/fruit snacks, flavored yogurt, fast food, etc.). And according to The Food Marketing Workgroup, the junk food industry spends almost $2 billion a year on marketing to young people (!!). We all know that marketing tactics and words can be confusing, even as educated adults. The words “natural,” “real,” “whole grain,” or “whole wheat” are just some of the terms that get used in various contexts. If we have a tough time wading our way through the terms, how in the world can we expect kids to have any luck? 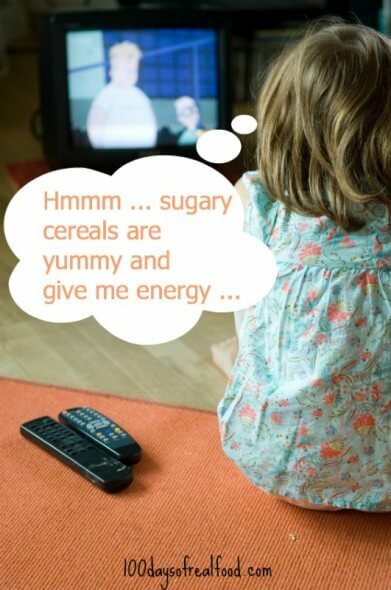 Studies have shown that food advertising can contribute to numerous health problems including being overweight, which, by the way, has increased to 35% of children aged 6-11. Even on a day-to-day basis, it’s just plain annoying to have kids ask for food and products they see on TV that they’d otherwise not know about–products that many of us try to steer them away from as best as we can. And since we’re talking about it, how cool would it be to see advertisements for vegetables or fruits coupled with a kid-known celebrity or cartoon character (hint-hint Ad Council)? Naturally, we probably assume that things weren’t as bad when we were growing up. So here are a few related statistics. Not only are meals being supersized, so are the amount of ads targeting kids. In 2009, preschoolers viewed 21% more fast food ads than in 2003, children viewed 34% more, and teens 29% more. Here you can find other facts about fast food nutrition and marketing to kids. Each one is concerning in itself. Know what your children are watching, what sites they are surfing, and what games they are playing. Sounds obvious, but sometimes I’m amazed at what my kids are picking up since I obviously don’t watch over their shoulders at all times. Take some time to play the game they enjoy and sit down to watch a full episode of the show they tune into, without fast-forwarding the commercials. Familiarize yourself with their world and know that even school cafeterias showcase similar ads/banners. Try as we can, marketing to kids is not going to go away. Neither are processed foods or other unhealthy choices. As a parent, it’s your job to teach them to recognize what is being put in front of them and to help them realize they will have choices, but that they’re just that–choices. Help them understand how to navigate between a smart choice and an unhealthy choice. Also, a tip from Lisa, teach your kids that they can’t always believe everything they hear (including what they see on TV). Together we can make a difference. Urge Nickelodeon to implement a transparent policy for marketing to children that includes strong nutrition standards for all advertising and marketing through the company’s child-directed media. Ask Dairy Queen (or others) to improve their children’s meals. The CSPI is a great resource for other take-action initiatives. By not spending your dollars on processed junk food, you aren’t supporting their cause and you aren’t contributing to future marketing dollars. This is the simplest action that every single one of us can start doing today. Our team recently had the opportunity to hear Michael Pollan speak. One of his key points was that getting kids involved in the kitchen can be one of the most important things you do. From the most minimal tasks to actually preparing meals as they get older, get them started with the love (or at least understanding) of cooking. Cooking your own food and having your children participate helps you abstain from buying processed foods, including the ones marketed to kids. Here are 10 recipe ideas to get you started. 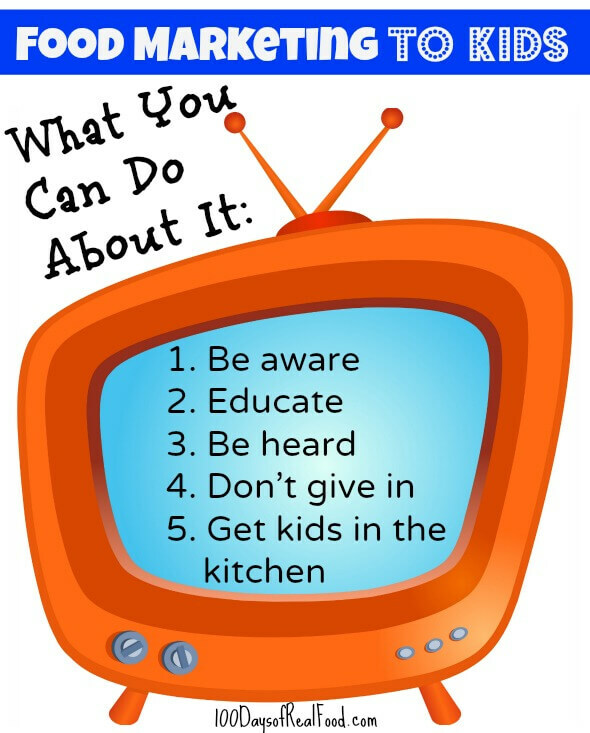 I’d love to hear your comments regarding what you do to monitor foods marketed to your kids. 100 Days of Real Food is a member of the Charlotte News Allicance, a corsortium of local media partners.